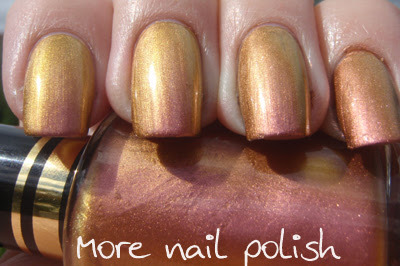 Yep, you got it, another Artform polish. #731 Pink Gold. 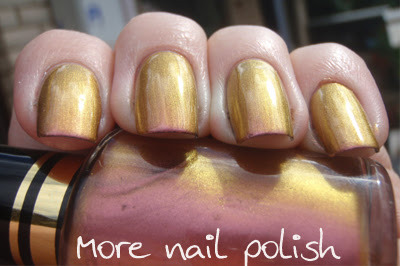 Rather similar to the last colour, except this is a lighter rose pink and the gold on this is more yellow than orange. Still a fantastic duochrome shift. This was two coats over a black base. 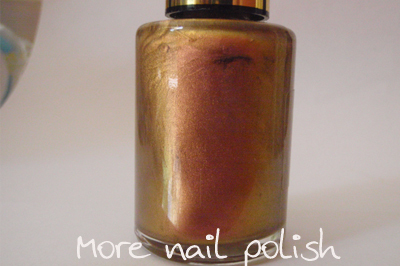 Also, only one more day to get your entries in for the holographic polish give away. There have been a stack of entries, so it will take a bit of time to sort it all out, but I will get done ASAP. I've got my thinking hat on at the moment to do a birthday mani for my boys 3rd birthday. Then I have to get cracking on an Easter mani. "Get cracking" on an Easter mani! Was the pun intended? LOL! 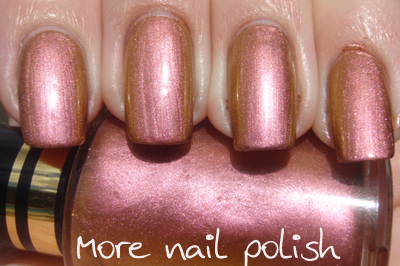 Yet another gorgeous colour. These Artforms are amazing! Can't wait to see both designs!!! Vita - hee hee, I can't believe I wrote that! And I never realised until you said so! That is an AMAZING duochrome shift! I don't think I've seen anything like it!